Mülheim-based THYSSEN SCHACHTBAU GMBH has been aiming to meet international standards in its workplace safety performance. After an intensive two-year preparation and training phase the existing Occupational Safety Management System, which is based on the SmS (system-oriented safety) quality seal issued by the BG RCI (Liability Insurance Association of the Raw Materials and Chemicals Industry), Heidelberg, has now been extended to include the SCC**:2011 Certificate of the international health, safety and environment management system. THYSSEN SCHACHTBAU GMBH therefore meets the requirements and standards for occupational health, safety and environment projection as laid down by the international project sector. For a specialist mining contractor engaged in delivering shaft sinking, drilling and roadway tunnelling projects at both national and international level, and to the very highest standards, what counts is not just the ability to perform these services to a high degree of competence but also the health, safety and environmental (HSE) standards that are applied at the same time. THYSSEN SCHACHTBAU GMBH, based in Mülheim an der Ruhr, has had the ‘system-oriented safety’ (SmS) quality seal since 2004, which is the equivalent of the international OHSAS 18001 standard (Occupational Health and Safety Assessment Series). In Germany SmS approval, which is awarded by the Heidelberg-based BG RCI (Liability Insurance Association of the Raw Materials and Chemicals Industry), constitutes a confidence-building measure aimed at clients, public authorities and other bodies. 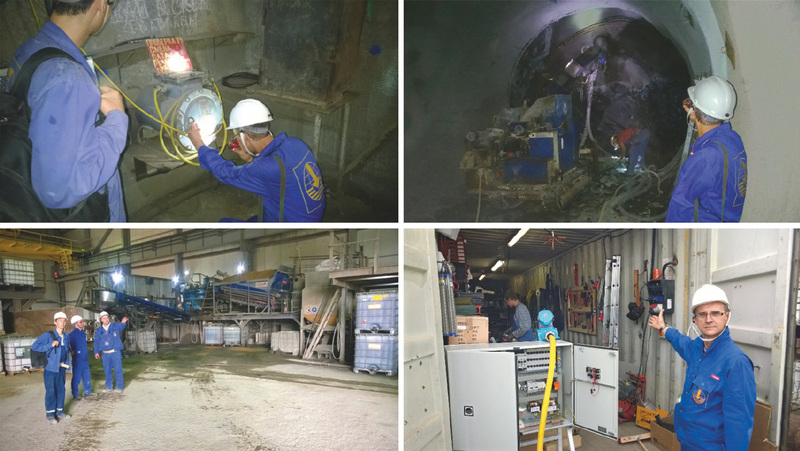 In the re-audits of 2008 and 2011 THYSSEN SCHACHTBAU was able to demonstrate the continuous application of a systematic health and safety protection system. When undertaking specialist underground operations at the Gorleben, Konrad and Morsleben mines, which are permanent waste disposal facilities operated by the DBE (German Service Company for the Construction and Operation of Waste Repositories), SmS certification is a prerequisite for meeting the extremely high health and safety standards in place in this sector. At Asse mine too a workforce trained to SmS certification standard is an absolute priority when it comes to meeting the occupational health and safety requirements. Fig. 1. Logo for SCC** certification according to ISO 9001. // Bild 1. Logo für die SCC**-Zertifizierung nach ISO 9001. The processes and behaviour mechanisms in place at management and operational staff levels, which are highly systematic in nature, ensure high standards when it comes to workplace safety and health protection. This behaviour pattern has made the ‘system-oriented safety’ (SmS) quality seal its own. In order to maintain and continuously revitalise the concept SMS requires intensive and regular monitoring of the procedures along with training sessions for everyone involved. THYSSEN SCHACHTBAU was not to be satisfied with the very high standards already achieved. The company therefore went one step further by addressing itself to the comprehensive safety requirements now being expected of contractors in the oil, gas and petrochemicals industries. The process of attaining this safety level once again involved a mobilisation and awareness raising exercise on the part of all 900 or so employees of the THYSSEN SCHACHTBAU Shaft Sinking and Drilling division to the effect that safety-relevant behaviour patterns were taken on board in an even more sustained and systematic way. The internationalisation strategy that THYSSEN SCHACHTBAU GMBH introduced in 2002 was aimed at expanding the company’s specialist mining activities outside Germany, which particularly meant the Alpine regions, the Balkans and eastern Europe. This realignment of operations not only required professionalism, motivation and flexibility at every level but also meant that for this reorganisation to be successful and sustainable it would be essential to incorporate workplace safety into the corporate concept right from the word go in order to ensure that the company could remain competitive in this specialist project market in the long term. On the basis of these strategic targets it was both logical and coherent to add to the existing SmS standard that had been in application since 2004 by seeking to extend the current Occupational Safety Management System to include the Safety Certificate Contractors (SCC) (Figure 1). As well as constituting another step on the road to competitiveness this move will at the same time ensure real progress towards greater legal security. In conformity with the Occupational Safety Management System the quality of the in-house safety arrangements will be extensively assessed, improved and – providing the scheme is successfully implemented – certified at each and every company level. Certification by TÜV Rheinland Cert GmbH in Cologne will provide the workforce with fresh momentum in their efforts to deliver effective workplace safety as part of the company’s national and international mining activities. THYSSEN SCHACHTBAU will therefore be the only specialist mining contractor to carry the SCC**:2011 certficate and as such will play a leading role as a promoter of occupational safety in the national and international mining sector. The safety certificate for contractors is a set of rules for a certifiable management structure. It therefore represents a unified health, safety and environment management system. Every process that is inspected as part of the SCC management audit is described in the THYSSEN SCHACHTBAU Health, Safety and Environment Handbook (HSE handbook). This manual corresponds to the normative SCC rulebook and reflects the company’s commitment to achieving the highest standards in this area. The handbook is accessible to every employee and is a mandatory part of their working remit. All managers and staff members are required at all times to abide by the legal regulations and operational guidelines that apply in respect of workplace safety and environment protection. They have to protect their own health and that of their fellow workers and in everything they do they must also ensure that environmental pollution, accidents and work-related illnesses are prevented as far as possible or at the very least kept to a minimum. It is the remit of every manager to take responsibility for occupational safety, health and environmental matters (transfer of duties) and the chief executive management undertakes to provide the necessary means and resources for this. Projects that entail project-related HSE requirements and agreements are given a client-coordinated project plan for target tracking purposes. The site manager remains responsible for all coordination and consultation dealings with the client throughout the duration of the project. If subcontractors and recruitment agencies are required to ensure the success of the project these have to be given instructions on the content of the HSE requirements before commencing work. The managers of these firms and agencies are to be provided with all the necessary information so that their personnel can be instructed accordingly. SCC certification requires each and every company employee to be fully trained and therefore differs in this respect from the SmS certification. According to SCC certification requirements more than 90 % of the operational staff of THYSSEN SCHACHTBAU must be trained and tested to appropriate safety standards. The systematic assessment and training of the workforce requires a huge amount of effort and company employees have to be supervised on an ongoing basis not just when working in German mines but also when carrying out shaft sinking, roadway drivage and drilling operations in Austria, in the Balkans and in Switzerland, as well as in Russia and Kazakhstan (Figures 2, 3, 4). The introduction of the SCC health, safety and environment management system was accepted without reservation by the working teams involved. The operative managers were tested and assessed by TÜV Rheinland as part of the certification process. A procedure was also introduced in conjunction with TÜV Rheinland aimed at ensuring that the appropriate professional qualifications were in place. A personalised safety pass will henceforth be assigned to employees that will apply throughout their working life in the same way as the personal log-book that was traditionally issued to mineworkers. The safety pass records all the individual instruction courses and training programmes that the holder has completed. The testing and certification process will remain valid for a period of ten years. Refresher training courses are held every year for staff from the occupational safety and works medical departments. In addition, only those subcontractors and recruitment agencies that verifiably operate a fully functional HSE scheme will in future be included for project deployment. The strategic launch of the HSE management system is clearly a statement on the part of the company that it attaches real importance to having a safe, healthy and environmentally sound workplace for all its employees. Monthly inspection reports from the senior management level and operational management level are a mandatory requirement. The inspections cover various themes so as to include as broad a range as possible. The inspection reports and annual progress reports from the safety department and works medical officer form part of the management review. This approach ensures that an effective system is in place when it comes to effectivity checks. The procedure that THYSSEN SCHACHTBAU uses to record and analyse accidents has been extended to include near-miss incidents. ‘Last minute risk analyses’ (LMRA) are now carried out immediately before starting work. The agreed standards define thresholds for the accident frequency rate and place accident statistics at the centre of the evaluation. Every accident is entered in the accident statistics from the first day of incapacity (SmS from the third day of incapacity). The SCC thresholds that have to be met in order to maintain the validity of the certificate are specified within very narrow limits and are based on the respective BG accident frequency statistics. The THYSSEN SCHACHTBAU figures for accidents resulting in more than one day of incapacity have shown positive trends in recent years and while in 2012 there were 4.75 accidents recorded per million hours worked this improved dramatically to zero accidents recorded per million hours in 2014. The projected accident target was therefore achieved, in line with expectations. Waste prevention lies at the heart of THYSSEN SCHACHTBAU’s environmental philosophy. The best way to protect the environment is to avoid waste and conserve resources. The main concern is therefore to prevent environmental degradation and to minimise the environmental impact through the efficient use of materials and equipment. Operating material has to be sourced from suppliers, as the company does not manufacture any products of its own. The company’s prime objective during construction and assembly work is therefore to protect and conserve the environment and to eliminate negative environmental factors by way of environment-friendly fabrication and assembly techniques. All the materials used are identified and their environmental impact is assessed. If necessary, appropriate preventive measures are taken in order to rule out negative environmental effects. For THYSSEN SCHACHTBAU the SCC**:2011 certification means taking a holistic view of occupational health, safety and environment protection measures. This new set of company practices, which are based on the HSE handbook, are binding for all and can be seen as a guarantee for trust-based cooperation both within the company as well as with clients and subcontractors. The systematic training of management and staff, combined with countless effectivity checks, underlie the long-term success of the HSE management system. These measures make a huge contribution to the company’s positive business development and to the safeguarding of jobs.